I guess I'm pretty vain, and a bit too proud of myself. I thought I had made up the world's newest egg casserole and I was about to share it with all of you. I was just trying to come up with a name. I was thinking "Putemtogether." And I thought that was pretty cute. Because, you know, I just put eggs and zucchini together. Well, then I decided to run a quick Google check for egg dishes to make sure there wasn't anything similar out there that I should know about. Low and behold, I found the frittata. Which looks just like what I made up. 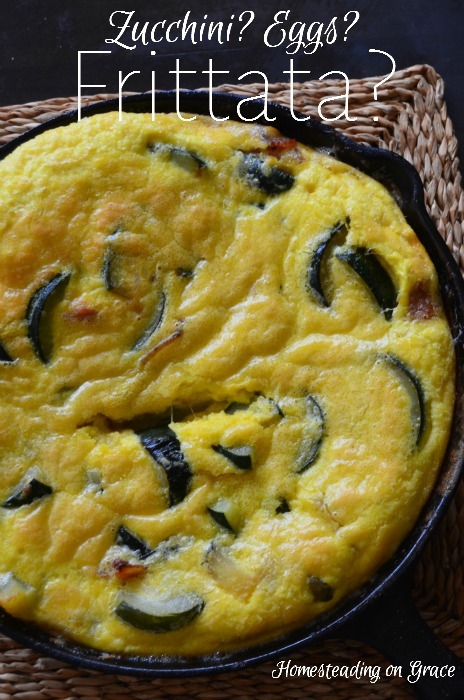 So I come today to show you how I invented the frittata at my house. Firstly, I have eggs. Eggs out the whazoo. And zucchini. Zucchini out the whazoo too. We're having to get a little creative with all these eggs and zucchini. We've done the soft-boiled, the scrambled, the fried, egg salad, egg omelets, egg quiche, etc. With the zucchini, we've had it fried, sauteed, roasted, on tacos, grilled, baked with cheese, etc. It is so good, and we have so much, I decided to make something with it for breakfast. I chopped up a sweet onion and one zucchini. I cooked those in some butter and olive oil. This is another one of those meals that doesn't take set ingredients. So for the first one I made, I used cream cheese with 8 eggs. For this one, I used Monterey jack cheese. Both good options! I kept cooking the veggies until they were cooked to perfection. You know, a sweet onion cooked just right is one of the great joys in life. And you know what else? I used to refuse to eat them. It's only been in the past few years that Jeremy has convinced me to start eating them. And this year is the only the second year that I'll eat tomatoes that aren't made into ketchup. I am really growing up. I seasoned everything liberally with salt and Italian seasonings, but you could use whatever you wanted. (I haven't been using pepper because it seems to bother Noemi.) I also had a couple of extra strips of bacon, that I crumbled up and added to the veggies. Then I poured the egg mixture over the veggies. I baked it at 350 for about 15-20 minutes. It didn't take long at all to cook, so watch it carefully. Then came the test. If I can get Jeremy AND the kids to say something is good, you know it is! And everyone agreed. It's good. So have you ever invented a frittata too? Love to find a recipe I haven't tried before. 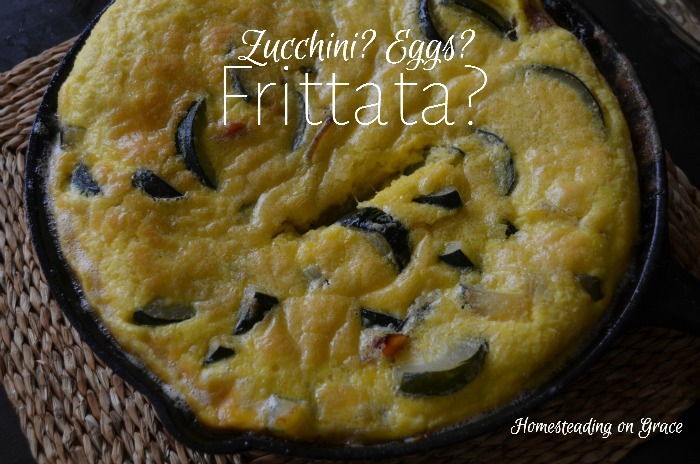 Zucchini Frittata sounds delicious and Zucchini in the garden will be ready soon. Thank you for sharing with the Clever Chicks Blog Hop! I hope you’ll join us again next week!